I'm Ryan, a 30-something engineer. 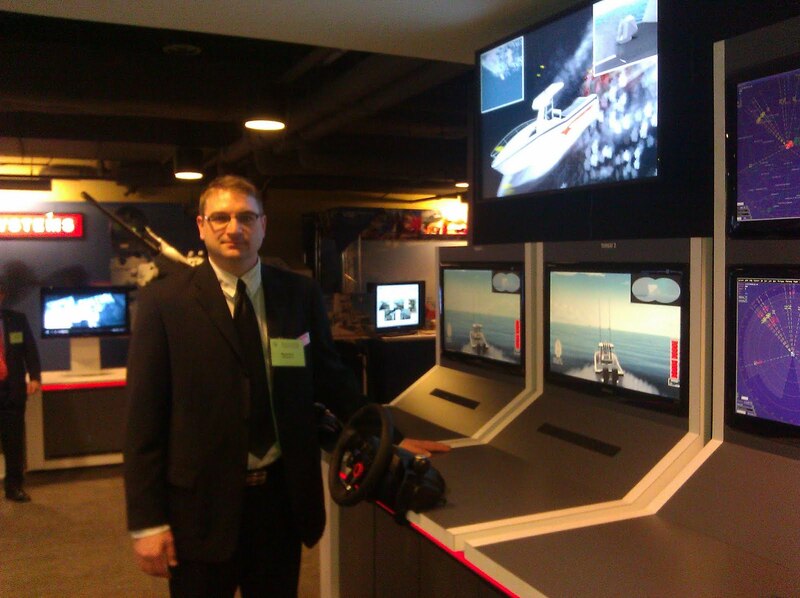 This is my blog about my geekdom, my family and my life. Come with me on my journey to becoming a game developer and other nerdy endeavors. While on my recent business trip, I spent my time at the airport and on the plane programming a game concept I've been thinking about a lot lately: Hungry Monsters (the first prototype). Fair warning, there is no game play yet, but merely a rapid prototype of the game play elements, specifically the resource management of employees, work stations, ammunition and the actual playing field. 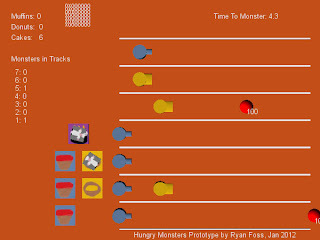 Hungry Monsters is very similar to Plants vs. Zombies, but with my own engineering spin on it. What's different, at least in my design, is that the player will have to decide how to spend their resources differently by running a bakery to provide the food (the ammunition), as well as place weapons to fend off (feed) the onslaught of hungry monsters. Players will have to decide if they place another muffin shooter, an oven, or another employee for instance. The prototpye at this stage doesn't allow the player to do anything yet, but was built to allow me to investigate the idea. Through the Unity Editor I'm able to try different combination of things. Considering this took me about 6 hours (built from scratch in airports and on the flight for a recent business trip) I'm pretty happy with the outcome and excited to move on. Please excuse the Microsoft Paint artwork and simple geometry, it is a first pass prototype! I was out of town this last week, employed as a booth bunny for a simulation demonstration we made to showcase a number of our systems. It's fun and frustrating and exciting and boring, all in one! I'm working on a freelance gig for a mobile app. I won't go into much detail, but its very entertaining. 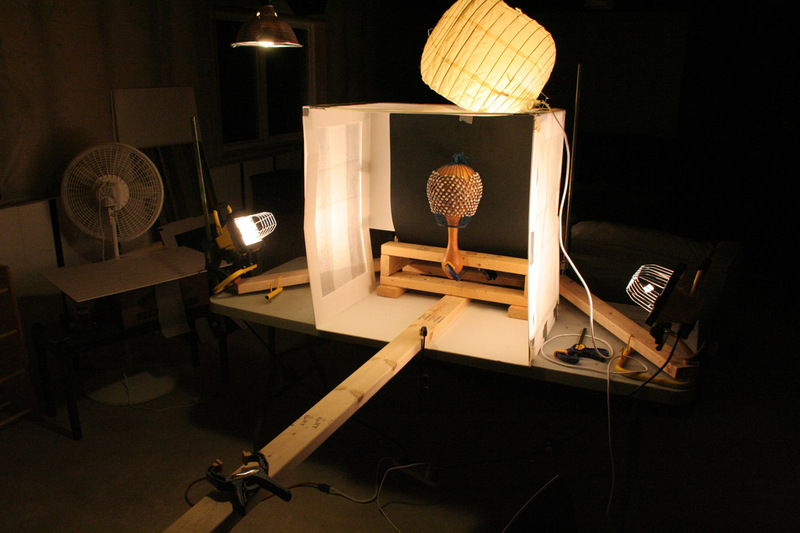 I'm building some interesting photography setups to take some pictures of things I never thought I'd be taking pictures of. 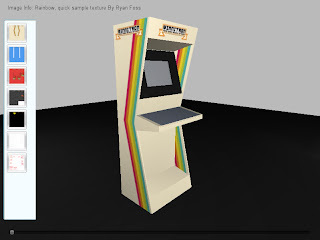 I've made a Unity Web Player version of my Arcade Viewer for the Minnetron 10,000 Arcade Cabinet I've been building. My intent was that this would both show how the cabinet goes together (since I built it digitally in Blender first, why not use it?) and to allow others to try out paint job concepts. To see the "game" click on the image. You may need to install the Unity Web Player, but it will be worth it! Or just download the Windows executable. FYI, the name "Minnetron 10,000" is a play on the Minnesota nickname "Land of 10,000 Lakes". I went crazy with costumes this year and got the family to do a Plants vs. Zombies theme. We even made it onto the Plants vs. Zombies Facebook page! 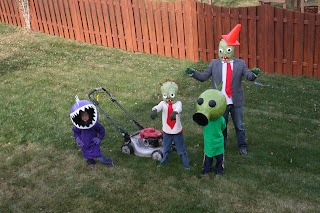 More pictures in my Google+ Plants vs. Zombies Halloween 2011 gallery. Construction continues as you can see in the image below. I'm almost done with all the major cutting and nailing. Just four more cuts on some plywood and I should be ready to sand and poly. I was about to finish the control panel but I decided to take a step back and think about how I can build it so I can get at the controls and wires without a lot of trouble. I learned from my controller experiment is that my wiring connections needed to be checked and rechecked. Even though I was using the right connectors, I was fighting the contacts. I think I know what to do right this time, but my test controller was open on the bottom which facilitated working on the button and IPac2 connections. 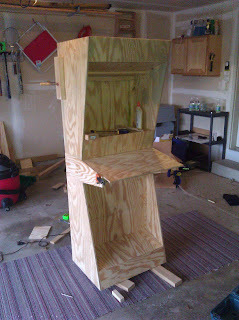 For this arcade, I want to make sure I can build and get at the buttons without too much trouble. If you've been to the IGDA Twin Cities meetings, or have seen any of the videos (here and here) where I presented the idea of collaborative game developing, you know that the group is off and running. We're moving forward with a Mr. Driller inspired climbing game of block destruction. We've done a lot of development over the two months we've been at it. However, at the last meeting a number of bugs showed up during the live demo. Due to certain circumstances (my laptop fell to ground and quit working) I ran the game demo on a netbook. Although the game still played well, a number of bugs appeared more often than in my play testing, probably related to framerate and physics calculations. As a game developer, something I've always wanted to do was program a Tetris clone. Why? Well, because although its simple, its also a good exercise in programming for a novice game programmer. Alas, its also one of those things I've never done (but always think about). Given the troubles we're experiencing with the existing block falling code in the game, I decided it was time to take a crack at it. I'm building my arcade cabinet in three parts: top, bottom and controls. These pictures show me putting the top and bottom together. It's the right height and seems pretty stable.